Normally when car prototypes are seen running around public streets, they use this goofy, not-at-all-inconspicuous swirly camo to throw off spy photographers. That’s not the case with whatever this thing is. We suspect it’s the new Volkswagen three-row SUV, and it’s wearing a most impressive disguise. 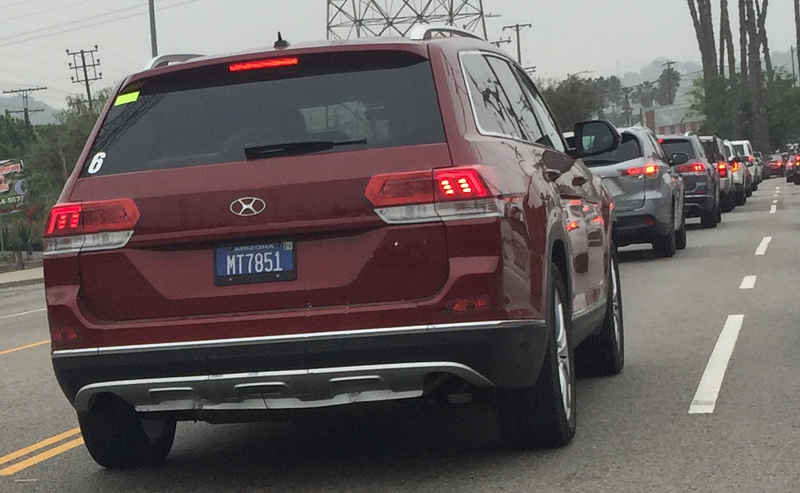 These photos of a trio of SUVs come to us from our friends at Mashable, and despite the Arizona plates they were seen in Los Angeles. Mashable reached the same conclusion we did—that these cars are very possibly, in some form or fashion, the new Volkswagen SUV set to be built in Tennessee previewed by the CrossBlue concept from way back in 2013. What’s interesting is the way they were disguised, with body-colored cladding, a cheap and indistinctive grille, and a very curious (and vaguely Hyundai-like) “X” or “H” logo front and back. It’s very possible this is something else, but from that rear tailgate I’m willing to bet it’s the new VW SUV. Then again, that car doesn’t have the most original styling in the world, so it’s very possible it’s something else. Got any theories? And if you see these bad boys running around LA (or anywhere else) send them to tips@jalopnik.com.